Tonight’s #FoodTVChat with Rosa Graziano will be a guaranteed good time! How do we know that? 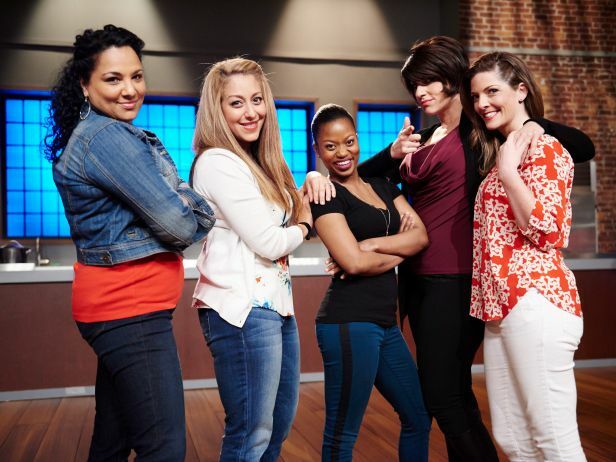 Well the Rosa you saw on Food Network Star and Star Salvation–you know the Rosa who seemed like she should be hosting her own Girlfriend GNO Food TV Show–that’s the real Rosa! We had our usual pre-#FoodTVChat phone call with Rosa yesterday and girlfriend, we talked for hours and could have talked for hours more. Rosa was a blast….and that’s how we know you better not miss #FoodTVChat tonight, 7PM Eastern! Rosa was born in Northern New Jersey and learned Italian cooking the family way—working alongside her mother in the family deli and catering business, DePalma Brothers in Palisades Park. When she moved to Southern California she noticed the absence of authentic Southern Italian cuisine and saw that as a business opportunity. She started a food truck called Rosa’s Bella Cucina that she says was was like an Italian “deli on wheels”. Although she didn’t win this season’s Food Network Star, she definitely has the personality and the passion for the format that has become the current Food Network standard, the restaurant road trip. I would bet that Rosa could get even the most guarded chef to give up their top secret ingredient to their signature dish on national TV and not even mind! Well even though we talked to Rosa for several hours we still have lots of things we would like to chat with her about on #FoodTVChat with Rosa Graziano and you know you do too. We are hoping that some of her BFF’s from Food Network Star will join in also…@medmomamichelle, @biteandbooze, @rusrusike, @fitchefeddie, @arnoldmyint? Will we see you tonight? Hope so! 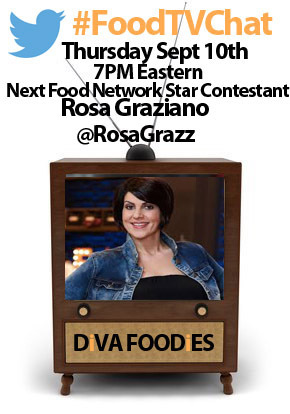 Tonight, 7PM Eastern #FoodTVChat with Rosa Graziano. Be there!